Born in Syracuse, New York, Nancy spent a good portion of her school years overseas in England. Her interest in food and wine was sparked by family travels abroad throughout her childhood. After attending college and graduate school back in the States (she earned a Bachelor of Arts degree in government from Hamilton College and a Master of Arts degree in international relations from The Fletcher School at Tufts University), Nancy ventured to California where she discovered a true passion for wine country living. She lent her many marketing talents to such well-known brands as Chalk Hill Estate Vineyards & Winery, Champagne Perrier Jouët, and Kendall-Jackson. Her creativity and communication acumen placed her in high demand when she went on to work as a freelance marketing consultant for a number of Sonoma County wineries. Before accepting her current role at Gary Farrell in November 2011, Nancy was General Manager of Wine Creek LLC (Quivira Vineyards & Winery, La Follette Wines and Torbreck Vintners) for 4 years. 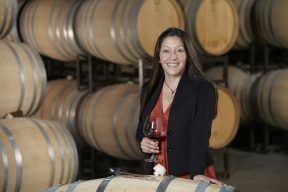 Theresa Heredia brings extensive experience with cool-climate Pinot Noir and Chardonnay as well as small-lot, singlevineyard wines, to her position as winemaker for Gary Farrell Winery. She specializes in Pinot Noir and Chardonnay from some of the top vineyard sites in the Russian River Valley and Sonoma Coast and is guiding the evolution of the Gary Farrell Winery house style while maintaining the signature elegance, balance and bright natural acidity. “My approach to winemaking is very much about taking advantage of specific vineyard and fruit qualities,” says Theresa. “I like to tailor the winemaking techniques specifically to each block of fruit that we receive separately. My job is to treat it as gently as possible so that we end up with a balanced wine.” Theresa joined Gary Farrell Winery in 2012 and was previously at Joseph Phelps’ Freestone Vineyards on the Sonoma Coast, where her Pinot Noir and Chardonnay brought the winery significant critical acclaim. She made the first vintage of Freestone wines in 2002 when it was still an experimental project at Phelps, and she later moved to the Sonoma Coast to open the new Freestone winery in 2007. In early 2012 she was named “Winemaker to Watch” by the San Francisco Chronicle, reflecting her interest in wines that offer a pure expression of their vineyard site and her willingness to experiment with different winemaking techniques. Theresa has a hands-on, Burgundian perspective with her winemaking, having worked in France at Domaine de Montille. She trained with renowned winemaker Craig Williams at Freestone and at Joseph Phelps Vineyards in the Napa Valley, after starting her career as an enologist for Saintsbury. Theresa was a Ph.D. candidate in chemistry with an emphasis on enology at U.C. Davis, before leaving to follow her calling as a hands-on winemaker. She has a bachelor’s degree in biochemistry from Cal Poly, San Luis Obispo. She lives in Santa Rosa with her partner where they enjoy all the amazing food, wine, drinks and outdoor activities that Sonoma County has to offer. Some of her favorite activities outside of work include traveling, camping, hiking, swimming, yoga and sipping on super creative cocktails.